The majority of clicks happen on the CTA button, even more than on the image itself. ‘Learn more’ is a favorite among users because it’s considered a low-pressure call to action. Facebook ads have more text and headline options so we’re able to communicate more info and qualify the customer more, this is where Instagram falls short. We suggest testing ‘learn more’ vs ‘sign up’ if you’re going for lead gen because users often aren’t ready to convert with the little info that the Instagram ad unit allows for. Instead, use your Instagram caption as a hook and then make sure your landing page is optimized for your desired conversion and all the necessary info is readily available. For e-commerce though, ‘shop now’ acts as a good filter to make sure you’re getting users who are ready to browse/shop. 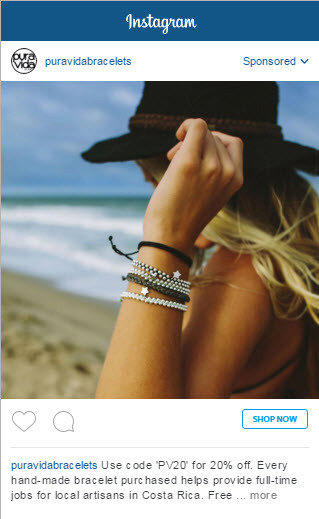 The 20% text rule applies to Instagram too but don’t feel like you have to include text just because you can. Text overlays don’t work as well here as they do on Facebook. Instagram found success because of its simplicity and emphasis on visual content so you should incorporate those elements into your creative strategy. We find that creative often has to be of higher production quality than what we’re using on Facebook. You want your ads to fit in seamlessly to the user’s feed so go easy on the branding and focus on building strong visuals. We’ve found that lifestyle shots with a product focus work best. Like Pinterest, people use Instagram as a source of visual inspiration and like the idea of ‘buying into’ a particular image that appeals to them. We always try to keep the product as the focal point of the ad so that users know what we’re selling but we’re also promoting the lifestyle that goes with it. Keep the product as the focal point of the ad but also promote the lifestyle that goes with it. When a user clicks on the ad they are presented with an overlay to confirm their intent. This overlay acts as a good qualifier making sure that the user knows where they’re being redirected to and confirming their intent a second time. This may mean fewer clicks and higher CPC’s but on the flip-side this also means fewer mis-clicks and by driving more qualified traffic to your site it’s very likely you’ll see higher conversion rates. It’s important to make sure you’re looking at the full picture and evaluating conversion data and not just looking at certain performance metrics like CTR’s and CPC’s in a vacuum. As we can see below, CPC’s were almost half the price for Facebook ads and CTR’s were double the rate we saw on Instagram. A pretty stark difference, yet, we saw almost identical cost per conversions! If you’re dealing with low conversion volumes on Instagram then try moving the conversion event upstream, optimize for events like add to carts, add to wishlists, form starts etc instead of checkouts or form fill-outs. If you optimize for clicks instead then Facebook will only serve your ads to users likely to click, and these users are not necessarily going to add any value to your business. 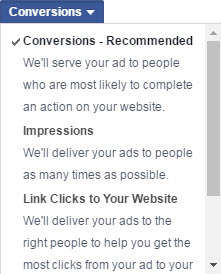 For brand awareness objectives where you’re just trying to get your ad served as many times as possible, optimize for impressions just like you would on Facebook. 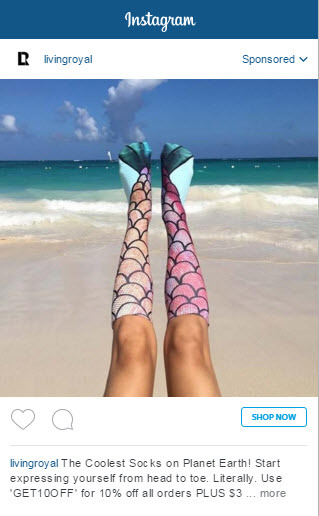 This will ensure you maximize your visibility and use up all the potential reach Instagram has to offer. For the caption, you’re working within a 300 character limit and only about 125 or so of these characters are visible above the ‘see more’ tag. Make sure you open strong and treat the first sentence like your headline. 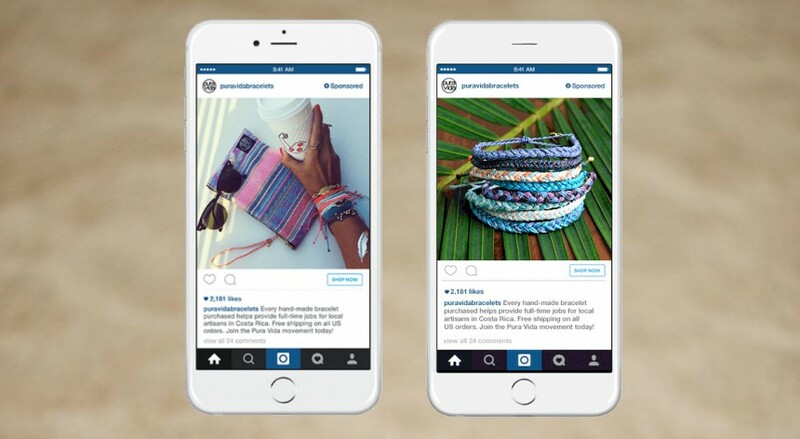 Instagram users engage with more posts per day than Facebook users do. In the example below, we spent twice as much on Facebook as we did on Instagram yet our Instagram reach was only 17% less. Thanks to strong user engagement, we saw incredible reach for our ads and a CPM that was 40% less than our equivalent campaign on Facebook. You can also see how easy it is to accumulate likes on Instagram as we were getting post likes at $0.33 vs $3.07 on Facebook – almost 10x the price! This ‘social proof’ adds a ton of value and lends authenticity to the brand and the offer. 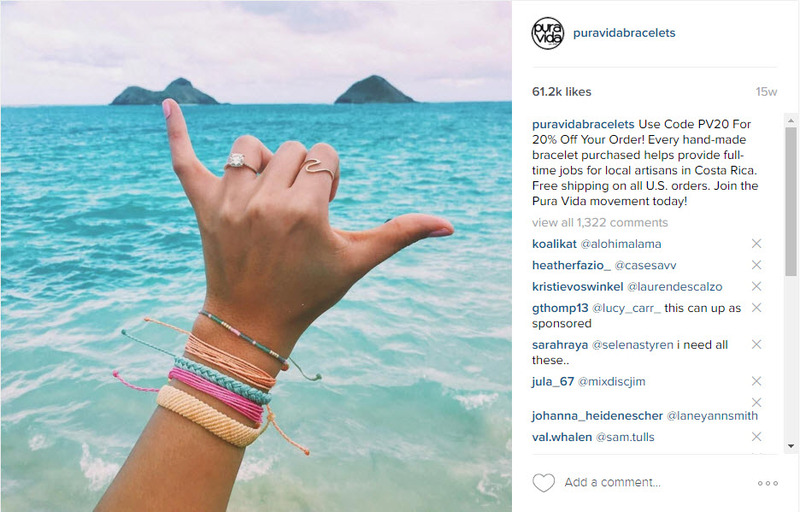 Instagram users are much less opposed to engaging with branded content as long as the visuals are strong. In 2014, Forrester found that “On average brands’ Instagram photos generated 58 times higher user engagement per follower than Facebook posts”. 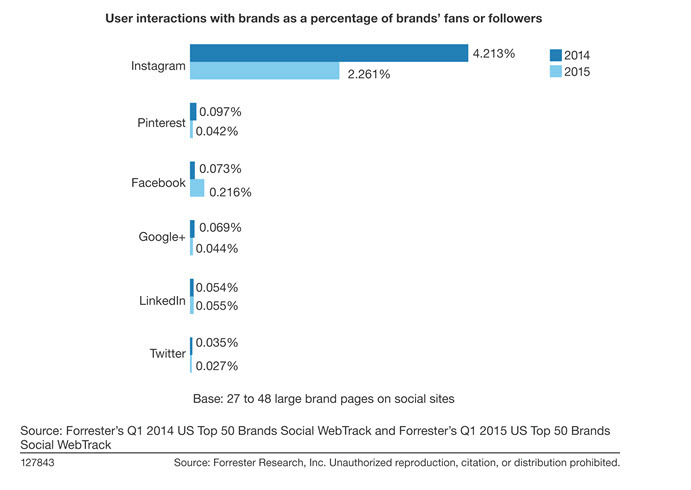 As we can see from the graph below, brand interaction fell by almost 50% from 2014 to 2015. We may see this number fall even further in 2016 with the new tweaks to the feed algorithm* but there’s no denying that Instagram is still the winner when it comes to social engagement. *Instagram will now be prioritizing posts based on user’s preferences instead of the standard chronological format users have become accustomed to. You’ve got to make sure landing pages and conversion funnels are optimized for mobile, the fewer clicks the better. Guest checkout options are a great idea, you can then try to get them to sign up to your mailing list in a follow up email which they may be happy to do on desktop at a later stage. With every user on mobile and already within an app, it’s also the perfect place to run mobile app install campaigns. 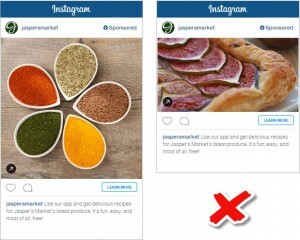 Unlike on Facebook, organic posts can’t include hyperlinks on Instagram. The app is immersive and the feed has an easy flow so users are more reluctant to click through on ads and be redirected to a website. By using a carousel ad, it basically gives you 5 chances to engage the user, sell your story and earn that click! Let us know what you’ve learnt from advertising on Instagram in the comments!